These are otherwise known as hardwood smoking chips or chunks. Wood chips are small while the chunks are, well, chunky. 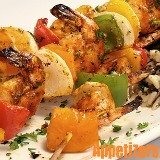 They are flavoring agents that infuse grilling foods with a desired wood flavor. 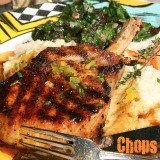 Using chips and chunks opens the door to stepping up the grilling game and trying out new wood flavors. Let us see how they can be used with a charcoal or gas grill. It is important to note that the 'science' of wood flavors, aroma and preferences is relatively subjective. 'One man's meat is another man's poison'. Experiment with different smoking woods and find your favorite flavor for different foods. Hardwood and softwood smoking chips and chunks are available and are used to produce just enough smoke to flavor your grilled food. Try and avoid softwood chips like spruce or pine. Even cedar wood chips are known to smoke a lot. Ironically, cedar scores highly in plank grilling. Softwood chips tend to emit bitter-like smoke. One of the most popular hardwood flavors is mesquite. It is has a mid-bold spicy flavor and tends to burn hot. 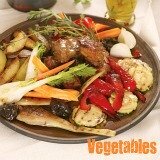 It is well suited for grilling beef, pork and vegetables. Consider using mesquite for larger cuts of meat as well. The next hardwood contender is hickory. It is known for its sharp cured bacon-like flavor. Try using it with pork, chicken, wild game and trout. Enter pecan. It has a nutty flavor but is not as intense as hickory and is good for your wild game, lamb, poultry, fish and especially pork. Other mild hardwoods include oak and maple running side by side as mildly smoky. Oak is particularly suited for the beef brisket and pork cuts, poultry and vegetables. Consider 'smoking' poultry and ham with maple wood. The rest in the hardwood ilk include fruit trees like cherry, apple and peach. These woods are known to infuse foods with a sweet flavor. They are mostly suited for delicate meats like poultry, ham and fish. Feel free to mix and match or blend different woods to experiment and create your own new flavor and patent it! Just kidding. If you are using smoking chips for the first time, try different wood flavors to determine your favorite. The same goes with the amount of chips you are going to need for flavor. Start off with a small amount, like a handful and 'feel' your way to perfect flavor. Grillspot Tip! - Anytime you try out a different wood flavor or amount of chips, keep a mental or written record of details to give you a point of reference for your next grilling session. If you have a weighing scale, even better. Make a habit of keeping records and you are on your way to become a grill master! Consider soaking your favorite chipmunks, I mean chips or chunks approximately 20-30 minutes before grilling if you want to do some 'smoking'. This helps to bring out more of the 'wood aroma'. Many cooks choose not to soak. Both lump charcoal and charcoal briquettes can be used in concert with a variety of smoking chips and chunks. Soaking wood chips in water also makes them to last a little longer in the charcoal grill fire because they tend to burn quickly. By soaking the chips, they will 'smolder-smoke' along as you grill. Try soaking only half of what you will use and have the other half dry. 'Feel' your way around it. It's not necessary to soak chunks. They take longer to burn out and will not easily soak. Try using a chunk or two without soaking. Allow your soaked chips to drip-dry for a moment before introducing them to the fire. Scatter the moist chips liberally over your burning coals. Add a pinch or two at a time so you can extend the 'smoking' time without putting out the fire. Adding wood chips is more conveniently done when you have a hinged cooking grid or grate on your charcoal grill. Cover your charcoal grill if you desire a stronger wood-smoked flavor and keep your top vents closed a little longer. Be sure to open your top vents at intervals to release some of the smoke. Intense smoke can soot and ruin your meat and overpower the meat flavor. Another rudimentary or simple way of introducing soaked chips to a charcoal grill is by enclosing them in a sheet of aluminum or tin foil. This extends the burning time of the chips. You can poke a few holes in the foil to allow the smoke to escape freely and flavor your food. Place your foil pouch on the coals and to the side, away from the drips. Using smoking chips to flavor grilled foods is not the same as 'smoking'. Smoking is a method using equipment, wood pellets and dust, specifically designed for 'smoking'. 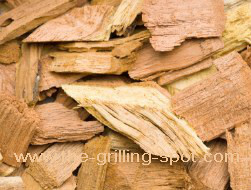 You can find wood chips in specialty gourmet, grilling or barbecuing tools and equipment stores. Many hardware stores that sell barbecue grills and charcoal have chips too. Your department store will have them on hand too. Wood chips work well on a gas grill too! A little differently but yes, by all means 'smoke' away on those steaks and birds! The first step to using smoking chips on a gas grill is knowing your grill. Some gas grills have a smoker box with a dedicated burner. Just add your chips in the box and turn its burner on high. When smoke starts to spew, turn the heat down accordingly. The pink color visible when intensely smoked meat is sliced is a result of smoking and not a sign of meat not well cooked. It is called a 'smoke ring'. If your gas grill is not equipped with a smoker box, no flavor for you. Anyway, there is a sure way out. Consider using a double sheet of heavy-duty aluminum foil paper or pan. Wrap the wood chips in the foil. Poke a few pencil-size holes in the foil. Place the foil pouch under the cooking grid on one of the hot burners on one side until you see smoke. Reduce the heat to the burner accordingly once it starts to smoke. If you desire a stronger flavor from your favorite wood chips keep your grill covered longer. Work with your upper vents or dampers to release some of the smoke at intervals. Aside from chips, we have wood chunks that are 'fist-sized' and are also used for flavoring. They are more suited for charcoal and wood fires as opposed to gas. Finally, we have logs that are even larger than chunks and are not practical even for charcoal grilling. Logs are best left for cooking in a pit or other types of smokers. Grillspot Tip! - Leave your top grill vents open if you are 'smoking' for the first time. Smoked food flavor is subjective, what one person likes may not suite another. Excessive 'smoking' can soot your food and ruin the experience altogether. Keep testing .... Be sure to work with your top vents to release some of the smoke as you practice with different wood types so as not to over power your tantalizing meat flavor! "You don't have to cook fancy or complicated masterpieces, just good food from fresh ingredients." "When I get a chance to play golf or go on a boat with good people, take the boat out and put some lobsters on the grill, get the ice-cold beer... that's heaven here on earth." "All normal people love meat. If I went to a barbeque and there was no meat, "Yo Goober! Where's the meat? I'm trying to impress people here Lisa. You don't win friends with salad." "Grilling, broiling, barbecuing - whatever you want to call it, is an art, not just a matter of building a pyre and throwing on a piece of meat as a sacrifice to the gods of the stomach." "It is very important that when you put something on the grill, you leave it in place to cook. If you move it around too quickly, chances are it is going to stick."